The Godin Summit Classic CT is a scorching & versatile rock machine for the ages! It features a beautiful sculpted maple Carved Top (CT), an incredibly light weight & resonant chambered Spanish cedar body, a mahogany set-neck with a bound Richlite™ fingerboard & headstock, large dot inlays, the Godin High-Definition Revoicer system, and Graphtech ResoMax bridge. 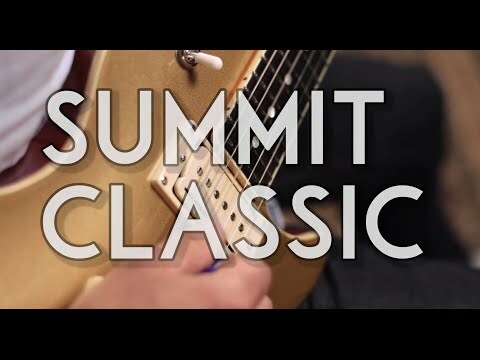 The Summit Classic CT is powered by three available Seymour Duncan pickup options which include: P90s, humbuckers, or P-Rails (allows the player to select between humbucker, single-coil or P90 tones all in one pickup). - Large dot fingerboard inlays. - Custom Polished high-gloss finish. - Graphtech ResoMax bridge system. - Godin High-Definition Revoicer system. - 3-way Toggle Switch, 1x Volume, 1x Tone. - 2x mini switches for pickup selection (on P-Rail model only). - 12" (300 mm) fingerboard radius. - 24 3/4" (629 mm) Scale. - 1 11/16" (43 mm) nut width.